A refreshing summer staple, the mighty Mojito has been given a makeover, and instead of embracing its rum roots, it's found a new love interest...gin. Once people had stopped drinking it for "medicinal reasons", the Mojito became a popular cocktail, drunk all over the world. In fact, Ernest Hemmingway of author fame apparently loved them so much he wrote about his passion. Not in a book - on the wall of a bar in Cuba. But he signed it, so apparently nobody minded. 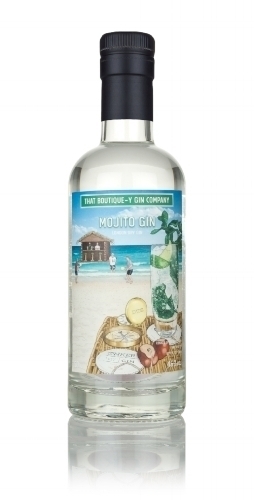 Flash forward to now, and the Mojito has had a rather exciting makeover - gone is the rum, and instead, That Boutique-y Gin Company has bottled an exciting alternative with all the refreshing Mojito qualities, but... there's GIN. Lovely, lovely gin. This Mojito Gin hails from Conker Spirit Distillery and contains all the refreshing crispness of a Mojito cocktail captured in a gin. Fresh mint and lime have been added to a classic botanical mix, all distilled with a molasses base-spirit that provides extra smoothness and a touch of rum-like sweetness. The recipe was developed with local rum expert Peter Holland aka thefloatingrumshack.com. Enjoy with soda water and a sprig of mint, or go full-on Cuban with a Ginjito cocktail. Nose: Initially there’s a burst of pocket peppermint followed by an underlay of sweet icing sugar and earthy juniper. Ripe lime emerges with time. Palate: The herbaceous notes add spice to the returning mint and bright juniper. More citrus and a little vanilla essence are present underneath. Finish: A touch of black peppercorn spice lingers. Overall: An incredibly refreshing tipple.